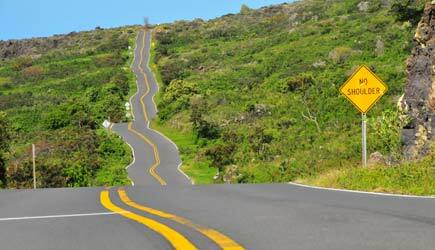 With all those hairpin turns and one lane bridges, the Road to Hana is a drive that everyone loves ... except for the driver of the rental car. Why not go with a professional driver/guide? 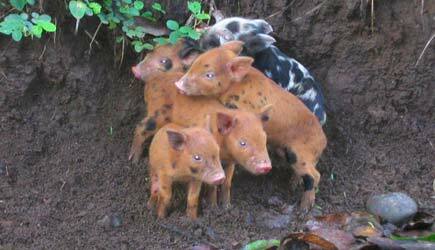 Everyone in your party can enjoy the same great sightseeing experience with this excellent tour! 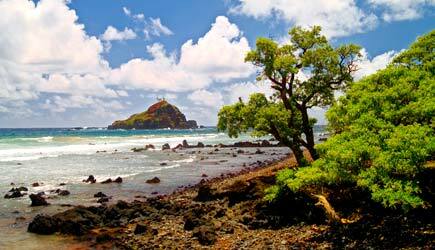 Tour the HANA coast ...in style; then continue your excursion on the magnificent road beyond Hana with Maui's #1 Luxury Tour Company. 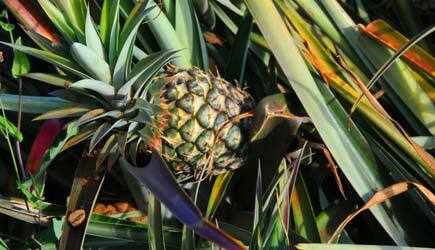 Valley Isle Excursions takes you on one of the most breathtaking drives on earth through Maui's tropical rainforest. 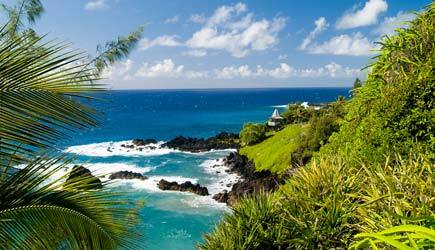 617 curves, 54 one lane bridges to Hana, pineapple fields, spectacular cliffs, bamboo jungles, waterfalls, tropical streams and pools, colorful and fragrant island flowers and rainforest vegetation are all to be enjoyed on your way to "Heavenly Hana". The tour includes pick-up and return to your hotel, continental breakfast, a very nice picnic lunch served on glass plates with metal silverware and a Hawaiian print tablecloth, and complimentary beverage service throughout the day. 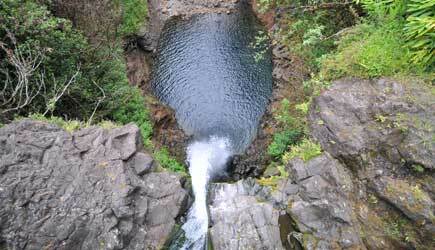 View waterfalls, the Keanae Peninsula, "Heavenly Hana" Town, and spectacular sea cliffs. 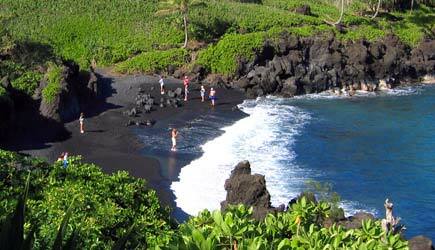 This tour makes between 10-12 stops including Wainanapanapa State Park where you can walk around on a black sand beach. 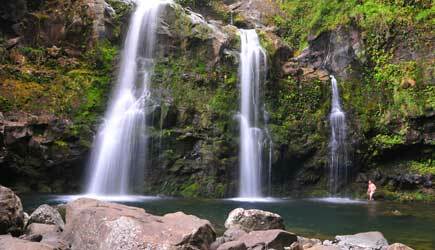 The tour also stops for an hour at the Pools of Oheo (also known as the Seven Sacred Pools) where easy hiking trails lead to viewpoints of several waterfalls. 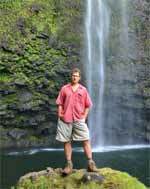 This tour goes all the way around the Haleakala side of the island, including the road beyond Hana where the rental car companies do not allow you to drive. This area includes Charles Lindbergh's Gravesite, the majestic gorges near Kaupo, the rugged lava coastline of South Maui, and views of "Upcountry" Maui.. The thing that makes this tour special is their luxurious Comfort Cruisers. 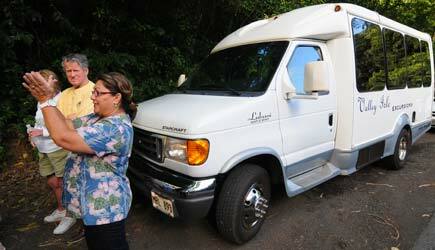 These air conditioned vehicles hold 12 people, each with an ultra-comfortable individual reclining chairs. From the elevated view from your Comfort Cruiser you see more than the views from a rental car that sits lower to the ground. Sit back, relax, and let their expert guides do the driving for you as they share their love for and knowledge of the Hana Highway. 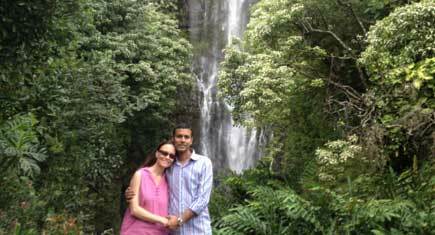 Valley Isle Excursions are superior to Hana tours offered by cruise lines because of the smaller vehicles and the more personal experience. Vegetarian lunches are available by request ... if you would like a vegetarian lunch please call our office after making your reservation using the form on the right. Because this is a long day (10-11 hours), this tour is not recommended for children under 3. Valley Isle Excursions does not provide car seats or booster seats, and you must bring your own if you need to use them. 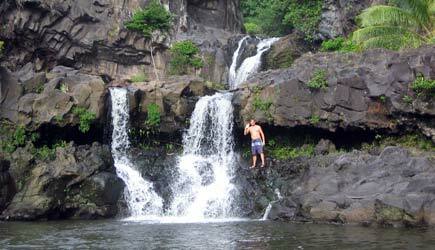 Swimming is permitted at the Pools of Oheo when water levels and weather conditions permit. There is no guarantee though, and no price adjustment on days when swimming is not included. 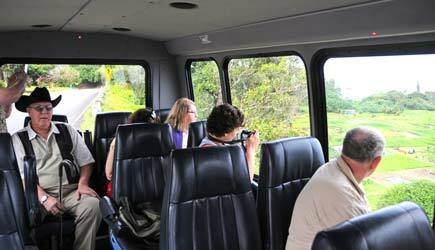 NCL cruise ship passengers are able do the Hana tour on their first day in port in Kahului. They will pick you up at the harbor shortly after you disembark. Please note that they cannot tour you on your second day in port.